Fired by some differences of opinion with the younger members of the family, I try to discover if there is any good in the student loan system. I suppose in many ways this is yet another attempt to distinguish between perceptions and some sort of truth. That student loans are a Bad Thing. Bad for students, bad for the nation. That having a political promise of a return to free education is a Good thing. That tertiary education is something we have a right to. That educating the population is something every nation should do to provide general improvement. Discussion across this week with the darling daughter established only that we had disagreement. I went to university in the early 70s, she went around the turn of the century, My nephew, her cousin, is receiving his degree very soon. Between us we have strong opinions, a family trait. When I went, fees were usually paid by the local Education Authority (LEA) and one applied for this in a means-tested way, plus any living expenses. In my case fees were paid by the LEA and my parents were advised that living should be successful on a number just over £500 per year. This required me to be careful on expenditure, but met my needs quite well, even funding some interesting adventures. The number of people going to university was around 8% of those of my age [source 1, p 14]. Subjectively, most of my sixth form went to university, but school leaving age was 16. For my daughter, I paid around £1000 a year towards what I think were fees and was unaware whether this was supplemented elsewhere – I do remember that there was comment that the costs were very similar to private education, which would have been around £2000 per term at the time, and what I think I was budgeting “per child” at the time. [English is very confusing here; by private education I mean non-state sector education, independent schooling]. I am well aware that these numbers do not match up. We were well aware that, having passed her majority, her life was independent, so we tried to make that position a reality. She tells me that LEA funding ended while she was a student, being £900 with some means-tested support element (about 50%, then in our case) when she began and £1200 when she finished. All but one of her sixth form went to university but only 20% of her cohort from state school in Cornwall, with around 40% perceived as going to university in her national cohort. She says: My total loan was just under £3k, which I paid off in about 2005 or so, i.e. when working full-time; I had been paying it off steadily since my first job in 2002. In those days one could choose to start paying one's loan off even if one earned very little. Her younger brother behaved in similar fashion. i) the number of disadvantaged students has risen in absolute and in relative terms. iii) only about a quarter of students repay their loans in full. I try, over the next several screen lengths, to establish the truth of these statements. I conclude that (i) is shown to be true, that (ii) is on the high side – and that I want to see a distribution, as ever, and (iii) gives loads of headaches because we can’t know this until a whole generation have been through the process. It is far more likely that the Treasury will change the rules and therefore the basis on which this money is recovered, or not. All I really discovered is that the state may eventually recover about half. If that is politically accepted then this is an effort towards social mobility, essays 231, 221 and earlier. i) The number of disadvantaged students has risen. There are record numbers of young people going to university and [also] the share of those students who are from disadvantaged neighbourhoods has risen. It was 9.6 per cent in 2009-10 and 11.3 per cent in 2015-16. In 2006, only 12.2 per cent of 18-year-olds who had been eligible for free school meals applied for university. In 2017 that figure was 22.5 per cent. So a rise both absolute and relative. Good. Source  tells us about the quintiles with the lowest measured participation rates and the bottom quintile had moved from around 10% in 2004 to about 17% in 2013. Fig 4, p10 of that source copied here. You want the bottom lines. ii) The average debt of student borrowers is £51,000. If and when a graduate starts earning above £21,000 they pay back 9 per cent of any additional income, and any remaining debt is written off after 30 years. The result is that, on average, the state forgives about £18,000 of the loan. The state and the students are sharing the cost of fees. Modelling by the Institute for Fiscal Studies suggest that we lend £11 billion but should only expect to get £6.5 billion of it back. I tried to confirm this number. Comment from here gave the relevant line: Ignore newspaper headlines about students leaving university with £50,000 of debt. That's a mostly meaningless figure. What counts is how much you'll repay; for some that's far more, for others it's free. What’s more they give a reasonable set of numbers showing likely outcomes (until the rules change again). The table shown is based upon the assumptions of: Borrowing £6,000 for fees & £8,200 living costs per year, so £42,600 in total. With 3% inflation & graduate earnings growing at inflation + 2% per year. What is relevant is NOT the amount owed as much as it is what it ‘costs’; what you repay across the next 30 years. look at the £40,000 line, who just succeed (if it is ‘success’) in paying it all off. Apart from issues of starting at <number> and growing at <rate>, paying off a £40,000 loan across 30 years with £122,000 is about the same as a mortgage and represents a 3.8% overall rate. I have attempted to add similar numbers. Realistically you would expect your salary to rise differently from inflation (mine was more like 15% above inflation every year until I hit a ceiling after about 15 years). Even so there is an argument that says that those who eventually pay off their loan have done so at fair but not beneficial rates (and I agree there is political argument that this should be smaller and more beneficial), while those for whom their degree provides little financial benefit are likely to end up paying remarkably little. Be grateful this is not calculated upon joint household income and worry that it may become so. We could take the numbers in the table and reverse the thinking so as to reflect what ‘loan’ total would be equivalent to what was repaid in line with the rules as expressed. Crudely, taking the 25000 line; take122,000 as target total, say 45000/122000 x £42,600 = £15,700. So if you were a disadvantaged (bottom quintile) student and you ran up a typical total and then didn’t succeed in profiting hugely from the experience (or set yourself non-monetary targets in life), you could argue that you paid only 37% of that loan back across a lifetime of work. 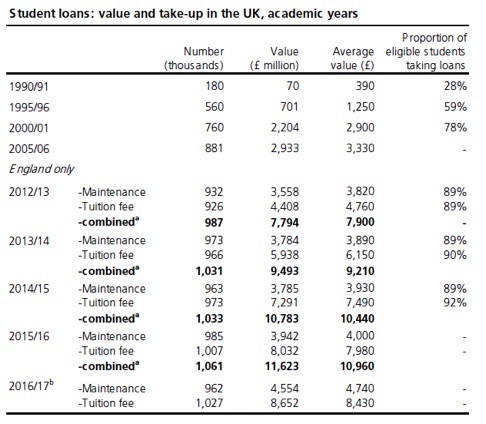 Some will argue that the value should be zero and that all of these loans should be free to everyone. We all pay for ‘free’ somewhere along the line and I see ‘free’ maintenance (what I think of as living costs) as somehow not right. But I am prepared to think differently if there is a similar proposal that says everyone in the country has a minimum allowance (think £21,000 per year), so we all have a minimum living state and then we’re taxed (etc) on whatever we have above that. A whole new world, possibly no better than what we have. This surfaced (again) during the last election campaign and you could research it and share. iii) Only about a quarter of those who take out a student loan repay it in full. Source  tells us a lot about student loans, correct at the time of writing (and you perhaps should read it, not what I pick from it). At the moment there is no return on the loan a student as taken out until their pay passes £21k, at which point the loan is charged at 3% above inflation for 30 years, at which point no more is collected and the remainder written off; payments are 9% of the income over the £21k threshold. I covered quite a bit of this in the previous section. 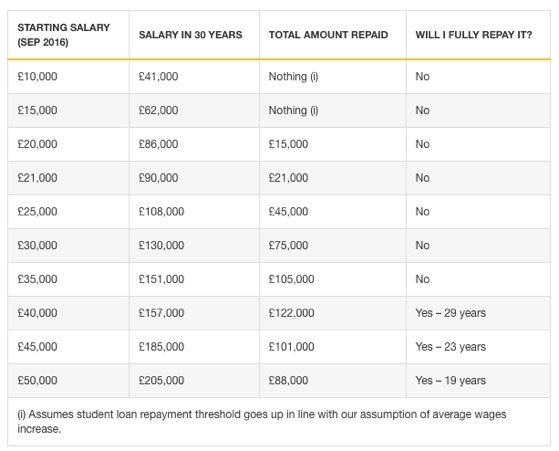 So someone on 40k will be paying £1,710 a year for 30 years, £51,300, probably less than the loan total was on leaving university. The prediction in  is that the proportion of graduates with some part of their loan written off will rise from 15% (pre-2012) to around 60%. A lot of the moaning is about change, when perhaps we should be looking at the result. In general, more graduates will make some sort of payment towards their loan and, in general, everyone will pay a bit more than they did. Partly, that is because the loophole that made these into very cheap loans has been closed. Only the very well paid will pay off their loans. You will find a lot of information, as I wrote already, fuelling a ‘change is bad’ argument, only because people pay more back. To me, what matters is what the return is on the loan. If, indeed, it really is a loan and if, indeed, the apparently vast sums are excusable. Please note that while the poorer student is more likely to need a loan, he or she will have a larger loan total, and is also less likely to pay it off from subsequent earnings. So, provided the rules don’t change much, they’ll experience a 9% extra tax of sorts for the benefit of having been to university. So in turn, they each have a target of making more than 9% than they would have done without the degree. That reads to me like an incentive. It isn’t 9%, it is 9% on the excess over £21k. On my highest ever pay that would be a maximum of £1250 a year, far less than I put into additional pension funds most of my working life. And what a fine idea that proved to have been. Did I confirm the statement (iii)? I don’t think I did. The Student Loans Company has started to publish data on repayments of income contingent loans by the year in which they became liable to repay their loans (the April after graduation or leaving their course). The latest data look at repayment cohorts up to 2015 and give limited information for the 2016 and 2017 cohorts who have no full tax year processed yet. 51% of students in the first large repayment cohort (2002) had repaid their loan; this fell off to 19% of the 2009 cohort and 6% of the 2012 cohort. The likelihood that a borrower was working, but earning below the threshold was clearly higher for more recent graduates; 27% for the 2015 cohort falling to 13-14% for the 2008 and earlier cohorts. The proportion who were in the UK tax system but not working was 8-10% for the more recent and 5-6% for earlier cohorts. A further 5-6% were known to be in the UK but with a status not requiring repayment. There was a large jump in the average amount owed by those who first became liable to repay from 2010. These cohorts were the first to mainly consist of students who had taken out fee loans for variable fees. The average amount owed by the 2009 cohort (when first liable to repay) was £11,800, £14,700 for the 2010 cohort, £16,200 for the 2011 cohort, rising to a provisional figure of £24,500 for the 2016 cohort. The first large cohort of borrowers who took out loans under the post-2012 system was the 2016 cohort, but the average is lower than might be expected as it includes borrowers under the pre-2012 arrangements and part-time students. The provisional figure for the 2017 cohort was £32,200. There is a shift over time from those repaying to those who have repaid as we might expect. The cohort data shows a relatively rapid increase in the number repaying within a cohort over the first few years of potential repayment followed by much less variation and a gradual decline in numbers as more repay their loans in full. The average value of repayments continues to increase in each year and hence totals also increase. 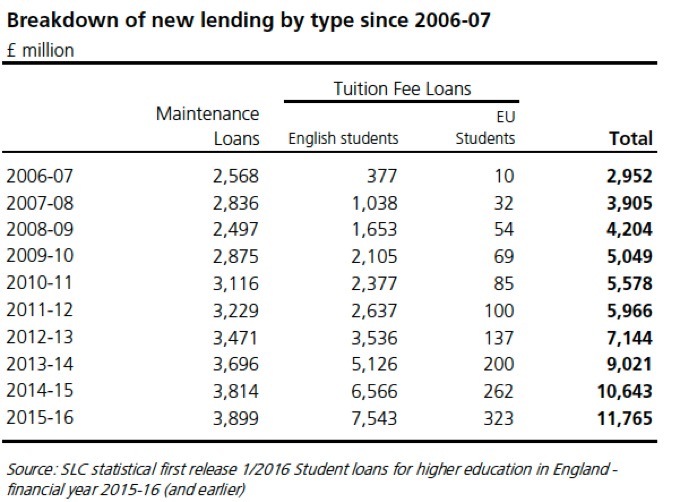 This suggests that it is only in the first few years after leaving higher education that large numbers of borrowers start repaying. Relatively few only start earning above the repayment threshold three, four, or more years later and even then their numbers are balanced by those who stop repaying for one reason or another. It may be some time before any longer term patterns become clear, particularly shifts from non-payment to payment. It is quite clear to me that a significant proportion of those with grants will see the only significant benefit being the moment when the loan is written off. For them, it doesn’t matter what the interest rate is - it could be negative and it would make to great difference to what they pay, only in how their loan stands to the state accountants. That same argument says that the only people who benefit from this are those whose assumed other loans are more expensive and who earn an awful lot of money. It makes a lot of sense to me to set the interest rate at or near to the government’s cost of borrowing. when something like half of all of the loan is going to be written off, this is merely playing with numbers - it is not real money once it is added to a loan pile. I do not think I discovered how many do or do not pay off their loans. Merely that it is not very many. From  An increasing proportion of the UK population is going to university, and more than half of people in their thirties now have higher education qualifications, up from just 36.4% (for those aged 30–34) and 31.4% (for those aged 35–39) just ten years ago (Figure 24). The number of graduates in employment has increased in all age groups over the past ten years, but the UK is not alone in this increase as other advanced economies are also developing their labour force. The UK has increased the proportion of highly skilled young adults from 32.6% of the population thirty years ago (the proportion of 55 to 64-year-olds with higher education qualifications) to 47.9% (the proportion of 25 to 34-year-olds with the same qualifications). However, this growth has been smaller than in many of our competitors, and the proportion of young adults with higher education qualifications remains lower than in many competitor economies. For example, the Republic of Ireland has nearly doubled the proportion of young adults with tertiary education, from 24.9% to 49.2%, in the same period. • It seems to me a very good idea to encourage social mobility by doing whatever we can to give people from the lower end of the household income spectrum opportunity to have further education. It is a given that this should in practice be inexpensive to them. • The current system, for all its vilification, actually works rather better than I expected. If one succeeds in turning further education into having significantly different income from one’s childhood, this is good. There are costs, but they are tailored to current circumstance. This seems to me about as good as it can be, short of making it free for all. • I remain largely unclear what is included or excluded. I recognise that becoming a bricklayer is not a ‘degree’ in the sense that I have understood it, but I am of the opinion that if qualifications such as degrees are a Good Thing for the nation, then I worry that a practical qualification is or is not being deemed as valuable. There is an academic argument that says it couldn’t be, but there are, I assume, courses that would include, let’s say, bricklaying, plumbing and electrical qualifications en route to a degree in something like construction. Mind, when I was talking with students doing Sports Studies, they said their courses excluded any (all?) qualifications in all sorts of sports, where I thought there should be a range (say, any four certificates) included automatically and free. I see a range being something like: refereeing a sport (say soccer), a training / coaching certificate (say Dukes Gold, swimming at <standard>), and a 1st Aid certificate (e.g. for the outdoors) . Plus, in my book, having access to a load more courses (and the opportunity to take them), perhaps at cost. Else what is the point? • That we need further thought what it is we want to call education. Is it really that the academic standards expressed in education levels (e.g. site) are the target? Is the nation improved by having 50% of us at level 6? Maybe it is. Does that mean that the other 50% should receive nothing, or something different, or something equivalent? We have a lot of evidence that says the future of the nation (implied, a better future) depends upon improving the level of education of the whole. How do we get there? When (if) I get a response from the youngest family member with his shiny new (and very good) degree, I will insert his contribution. Meanwhile I wish to publish. Extractions¹, below, somewhere. How I wish there were a ‘go to’ button. 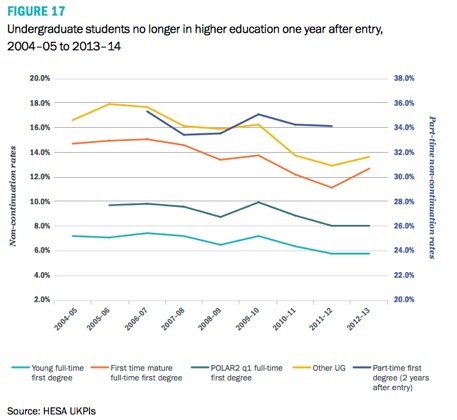 Shows many things worth knowing about; a dramatic drop in part-time course attendance [Part-time registrations are now 28.6% lower than in 2004–05. ]; non-EU 150,00 versus, say 583,000 from England; percentage of cohort 45-50% in the top quintile (half of the most advantaged students go to university). Fig 12 shows where the overseas students come from and how that has changed. Fig 14 shows age distribution. Fig 17 shows something I’ve written about before, drop out rates and shows something significantly different from that I’ve reported in the past, so I’ve copied it somewhere here. Table 4 shows the change in subject choice across ten years (away from IT towards biological science). Fig 23 shows unemployment for graduates. Fig 24 shows Percentage of UK population in employment with higher education qualifications by age, 2004, 2009 and 2014 , Fig 25 shows Growth in high level skills in the adult population, 2013 Fig 26 shows the changing qualification pattern of the population. The increase in the proportion of graduates internationally is meeting a growing demand for higher-level skills in the workforce as the global economy changes. Looking into the future, the UK Commission for Employment and Skills has calculated that the proportion of those in employment with undergraduate and postgraduate qualifications – which they use as an indication of the demand for these skills – will rise from 28.7% in 2002 to 51.3% in 2022, while those employed with skills below this level will fall from 71.4% in 2002 to less than half, 48.7%, in 2022 (Figure 26). It is clear that as the economy changes universities will play an increasingly central role in developing the UK workforce. As ever with data, someone else has decided what counts as ‘degree’ and ‘university’. Overall participation in higher education increased from 3.4% in 1950, to 8.4% in 1970, 19.3% in 1990 and 33% in 2000. Staff Pupil ratios (not what happened in class, elementary pupils divided by elementary teachers) were 40 in 1903, 30 in 1925 and 1958, better than 25 since 1972. Roughly. In secondary schools. sizes have grown steadily, from ‘averages’ of 200 in1914 to 900+ since 2002. Staff: Pupil ratio at secondary school (again. pupils divided by staff employed) was around 20 1920-60 and is more like 15 now. Rule of thumb known to DJS is that at 13 an independent school has problems paying staff, that 18-19 was the equivalent target in China and that, at 19 in the UK, parents were complaining about class sizes being too big. Don’t confuse the size of your class with this number. 18-19 as the average as used here implies many classes of 30+ in the lower school. We have about 7% of pupils in independent education in the UK. there was a 6% minimum in 1978 and peak of 7.5% in 1991. Look at the scarily spectacular graph on page 12 that shows A-level achievement: 1970 8% got 3 and 18% got 1; 1988 the comparable numbers are 12 and 22%, 1998 24% and 37%. Read into this whatever you like, or don’t like. Provisional results for the UK in 2004/05 suggest that 39% of the 17 year old population in the UK gain one or more A level or equivalent passes and 30% gain 3 or more. My older brother sussed me out when we were both quite young. When he wanted my parents’ attention at night without calling for them himself, he would simply lean across from his bed to mine and whisper “Noddy is an idiot”. The fuss caused by this slander against Enid Blyton’s hero would bring Mum and Dad running. Their sage counsel — which, come to think of it, they should have followed themselves — was simply to ignore it. But I found this advice almost impossible to follow. And I still do. I’m well aware that in politics you rarely persuade people. When you start arguing about some falsehood, you often succeed only in reinforcing your interlocutor’s sense of how right they are. During the European referendum, for instance, contesting Boris Johnson’s outrageous assertion about the £350 million a week that would be available to the NHS just raised the prominence of the issue. But I still can’t help it. Last weekend Jeremy Corbyn stood in Parliament Square and claimed that Noddy is an idiot, and I just can’t leave it alone. The Labour leader told protesters that because of tuition fees “fewer working-class young people are applying to university”. His offer is to “end the debt burden” and instead “tax the corporates”. In other words, he followed a fact that was completely incorrect, with a promise that is impossible and a policy that would be destructive. He almost certainly wants me to talk about it, because he wins votes whenever the subject comes up. But what’s a guy supposed to do? Let’s start with the incorrect fact. No, it is not true that fewer working-class young people are now applying to university. In fact, the opposite is the case. There are record numbers of young people going to university and the share of those students who are from disadvantaged neighbourhoods has risen. It was 9.6 per cent in 2009-10 and 11.3 per cent in 2015-16. In 2006, only 12.2 per cent of 18-year-olds who had been eligible for free school meals applied for university. In 2017 that figure was 22.5 per cent. In other words, since tuition fees started more students are applying to university, more are going and more of those who are going are from disadvantaged backgrounds. This isn’t that surprising. 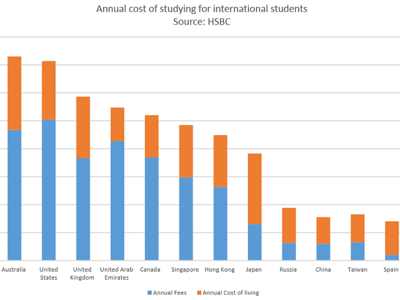 In a tuition fee system, more of the cost falls on the individual student. So they must make a judgment for themselves as to whether attending university is likely to be worth the money it costs them. And when, in 2007, Price Waterhouse Coopers assessed the value to graduates of a university degree they concluded that the financial benefit of completing a degree was greatest for those who came from families with lower levels of income. So, in so far as a tuition fee system deters anybody, it deters the children of the well off. The system ends up having a larger proportion of disadvantaged students. It is likely to be more egalitarian than the one Mr Corbyn wishes to replace it with. What, though, about “the debt burden”? Since educating people at university costs a lot of money, you can’t simply wish away the financial burden this creates. The only question is, who pays it? The promise simply to eliminate the debt burden is fatuous. There are two arguments often advanced as to why it shouldn’t really be the students themselves who pay. The first is a moral one, and not bad as it goes. “Your generation didn’t pay for university education, so why should we?” The second is that university education is a public good and brings benefits to all of us. So why should only the direct recipient pay? They aren’t the only ones who gain. Well, to start off with, the main reason my generation didn’t pay for their own higher education is that few people got any. That’s pretty much how the system worked. Give it away but not to very many people. However, even those who did get a “free” education have ended up paying into the system in the end. 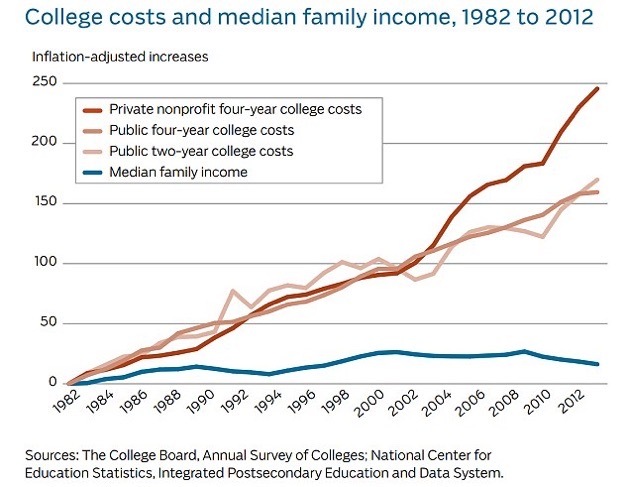 This is because it isn’t only the direct recipient of university education that pays for higher education now. It’s all of us. Let’s start with this. Only 44 per cent of university income comes from tuition fees. But this figure doesn’t take account of an even more important feature of the system. Only about a quarter of those who take out a student loan repay it in full. The average debt of student borrowers is £51,000. If and when a graduate starts earning above £21,000 they pay back 9 per cent of any additional income, and any remaining debt is written off after 30 years. The result is that, on average, the state forgives about £18,000 of the loan. The state and the students are sharing the cost of fees. Modelling by the Institute for Fiscal Studies suggest that we lend £11 billion but should only expect to get £6.5 billion of it back. By the way, this is a second reason why the current system is egalitarian. Those who pay back the largest portion of the loan are those who earn most. Those who end up on lower incomes are subsidised more. But Jeremy Corbyn isn’t satisfied with this. He’d like a system in which only “corporates” pay. The reality of course is that a rise in corporation tax would be paid for by employees, customers and those with pension funds. And to raise business costs in this way just as we leave the European Union is insanity. The result will probably be that the revenue falls short of expectations and we begin to cut university funding again, the very thing we were trying to avoid when the tuition fee system was introduced. That the cost of universities will now be less egalitarian and probably less generous is not, however, the greatest of the ironies of Mr Corbyn’s proposed system. I left that irony until last. The biggest enthusiasts for his reform are current students. His policy is even sometimes described as a bribe to them. But who would pay most if the change was made? Why, it would be people who had just incurred a large debt for themselves and now faced paying the additional costs caused by the corporation tax rise. In other words, the biggest losers would be today’s students. Look, there are things wrong with the current system. I worry about high interest rates and their impact on the less well off; that universities are acting as a cartel, with everyone charging the same price, and some are not offering students the quality of tuition they are paying for. But we have more students than ever, and more disadvantaged students than ever attending a system that is more successful than ever. If we swap it for the one that Mr Corbyn is proposing it won’t be Noddy who is the idiot. These were the ‘most popular’ responses to Daniel’s article, included to give you a flavour of reaction. I’m afraid I find very little of it relevant. How odd. This is incomplete without a mention of what the universities are actually doing with the money. Three things stand out: vice chancellors and their coteries are paying themselves like football stars - nothing less than theft; research has become an inflated joke - for every piece of science there are ten pieces of junk aimed only at the Breakfast TV market, the quality and quantity of teaching have both declined - students pay more for much less. Back to Corbyn - universities are another example of what the public sector does with money - it eats it. That students pay for their education is one thing, but it is shameful that we, society, are imposing interest rates of 6%- far too high and usury in nature. Corbyn's communist like moneytree economics of hate spite and envy will be his undoing - but he is as nowt compared to the off the wall McDonnell whi is the one who needs watching. I wonder how many of the students supporting Corbyn know that, despite being bought up in a manor, with a private prep school education and all the other advantages of a privileged background, he only managed two A-Levels at E-Grade. I guarantee that these grades would put him in the bottom 1 per cent of the qualifications of the students who support him. Now, we have a man who, aside from a few months as a reporter and a bout of VSO, his only jobs before being an MP were working for a trade union or as full time Labour councillor. The man has no experience of the difficulties of having to earn a living. And now, God save us all, he boasts that he will soon be prime minister. The students who support this background of his to be shouted out. An awful lot of money to have your lectures pre-recorded on Adobe Captivate and delivered by logging on to the University website. Your access to the library available through the computer in your bedroom where your seminars are conducted over Skype while you hand in your coursework by uploading it electronically to your tutor who marks it from her home and makes it available on your personal space on the Uni system. Your full time or part time course is little more than a glorified distance learning programme but your Millionaire newly 'minted' Vice Chancellor can get away will calling it 'blended learning' if his academic staff throw in the odd live lecture now and again or more commonly gets you to produce a 10 minute presentation after which your notes and power-points comprise the next set of downloadable lectures for the next cohort while your tutor places the book he's just written which is only available in expensive hardback on your mandatory reading list and counts his royalties. Nothing wrong with tuition fees in themselves but they are vastly inflated for a system that is no longer labour intensive and indeed cheaper to deliver. Daniel skipped very quickly over the quality of courses and quality of tuition issue. Running up a £50 000 debt with a good degree from a good uni is one thing, a tin pot qualification from a tin pot uni is quite another. The latter is a waste of students and taxpayers money. This is not being tackled. Even red brick unis are delivering less and less contact time for higher and higher fees. Students are not skilled at judging value - they simply expect a good tertiary education leading to full time gainful employment. They are not being rigorous enough in their choices or their rejection of anything less than satisfactory. Spot on. It really needs pointing out, as you have done, that even with tuition fees, taxpayers still subsidise university education to a large extent. Add to that the fact that in 1970 only about 10% went to university whereas nearly half do nowadays, plus many left school at 15 and 16 compared to everyone at 18 now. The cost burden has skyrocketed but the percentage of proper graduate jobs hasn't really increased during that time. Then you see the problem with our system. We don't need more obscure, low quality degrees, we need better technical and vocational education and apprenticeship schemes. The irony is, that although student numbers are rising, employers complain that they cannot recruit people with appropriate skills. Does this suggest that too many students are taking the wrong courses(The so called Noddy subjects) Perhaps the answer is to decrease fees for science and engineering etc and increase fees for the populist subjects. All, for a while, become the most important people in my immediate life and I don't really quiz them on which university they went to. We need all skills and abilities for a decent life and should respect all people for what they contribute to this world. It is arguable that we rate university degrees too highly. I have two myself so it`s not sour grapes. Both my children also have at least two each. In a long business career I worked with a number of very able people who did not have degrees and had, perhaps, a more original approach than if they had. I also worked with graduates who could do the Times crossword in ten minutes and had little grasp of practical reality. I think there are many important jobs which do not require a university degree. Very important attributes such as common sense, creative imagination, lateral thinking and getting the best out of a team of workers are not much represented in university qualifications. The fact that more children from poorer backgrounds are now attending university may be seen as a cause for congratulation. But how many of them are reading serious subjects at Russell Group institutions, and how many are doing Media Studies or Sociology at Bogshire New University (formerly Boghampton College of Further Education)? I was lucky enough to pass through the university system before tuition fees were passed on to students (in my day they were paid by the local authority of where your parents lived - though I'm sure they weren't anywhere near what is charged today). 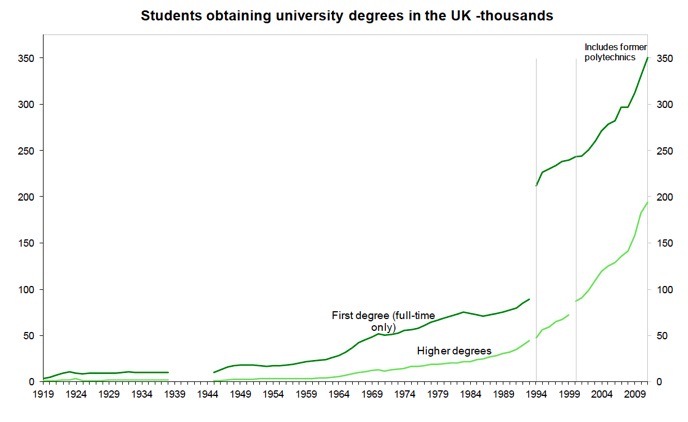 1) Why has the country rushed to get so many people onto university courses? No idea, just wondered. 2) Along with other comments here I believe there are university courses which greatly benefit the country and courses which do not. I do not believe the government should treat all courses equally. So let me throw this thought out there: how about we keep tuition fees but then subsidise those courses which are actually useful? - engineering, maths, science, medicine, etc. We could even propose that industry pays into this scheme to ensure the best courses flourish, maybe by directly sponsoring students. You want to study media studies? - go ahead but let's not pretend it has the same value to the nation as other subjects such as those I mention above. It would certainly make prospective students seriously think about the course they want to undertake. There is no logical basis for Corporations to be taxed at all. Their employees pay tax on their income. Their shareholders pay tax on dividends received and capital gains tax on the sale of shares. All the profits are accounted for in this way and any excess should be available to reinvest in the business. But the profits are a fat attractive target for government to take another bite out of. However, doing this depresses the wages of employees, reduces returns to shareholders (mainly pension funds) and prevents expanding the business by reinvestment of profits. It is a completely stupid thing to do but of course it is popular because the man in the street like Corbyn just thinks that Corporations are a fat target. And then wonders why he isn't going to get a fat pension. So Lord Finklestein wants graduates on modest incomes to pay 20% tax 12% national insurance and 9% for their student loan plus their pension contributions. Thats getting on for 50p in every marginal pound. If they are on higher tax rates they will pay 40% plus 2% NI plus 9% plus pension contributions. Roughly 55% on every marginal pound. How does this fit with Tory low tax incentivisation ? And how on earth can charging 6% plus interest be justified ? (3% plus inflation). And how can using RPI for the inflation figure rather than the lower CPI used to adjust pensions etc be justified ? The whole student loan structure is a cheap lie. It takes a large part of the true cost of higher education off the public spending books without making proper provision for the ultimate write-offs. If a public company did its accounts like that the auditors would not approve them. And it misses out the other pressure. For many people a debt of fifty grand is oppressive and stressful. Maybe not if you are a City Banker or Lawyer but on an average income. Saddling the young with crippling debt while they cannot afford houses is no way to run a country. It is debatable whether getting a degree for the sake of getting a degree is worth it, free or not. Possibly some, perhaps many, would be better off with a good apprenticeship - carpenters, electricians, plumbers and so on can make as much or more as some graduates, many of whom end up working in areas unrelated to their field of study. Many of them end up unemployed and/or unemployable. These days a degree does not necessarily equate with educated (although it might with indoctrinated). We should look at helping young people into a vocation at whatever level they are comfortable with and hopefully enjoy and to become valuable and appreciated by society. Let us not forget that the longer people stay in education, the better the unemployment statistics look (in the short term). An excellent article that lifted the fog in my brain on this subject. So many students who love Corbyn's anti-business rhetoric fail to realise they'd torpedo their own economic futures in our shrunken, poorer economy. Corbyn: went to North London Polytechnic to do "Trade Union Studies" and dropped out after a year. Did he pay for those wasted 12 months? 1 While these include data from later in this note, they also include others figures that were only produced as ‘one offs’ in the earlier years -Education 1900-1950 The report of the Ministry of Education and the statistics of public education for England and Wales for the year 1950. B R Mitchell British historical statistics chapter XV; Statistics of education 1975, and earlier editions, Department of Education and Science. Statistical abstract for the United Kingdom 1938, and earlier years, Board of Trade. Education and training statistics for the UK 2006, and earlier editions, DfES. Public expenditure statistical analysis 2006, HM Treasury. House of Commons Library Research Paper 06/09 Inflation: The value of the pound 1750-2005.  In 1900 there were 34,300 elementary schools/departments inspected by the relevant bodies in England, Wales and Scotland. On average they had 154 pupils each and aggregate attendance was 5.3 million pupils. There was an average of 42 pupils per teacher (of varying qualification levels).  There were 969 grant-aided secondary schools in England, Wales and Scotland in 1909 attended by 172,000 pupils. Their average size was 179 pupils and there was an average of 16 pupils per teacher.  In 1900-01 the average salary of a certified teacher in England and Wales was £128 for a man and £86 for a woman. Uprated for inflation these salaries would be worth around £10,500 and £7,100 in 2005 prices respectively.  5.9% of central government revenue was spent on education in 1900-01.  In 1910-11 there were 639,000 students who attended grant-aided establishments of further education (mainly evening classes/institutions) in England and Wales.  In 1919 28,800 pupils were entered for one or more school certificate examinations in England and Wales. In 1920 3,200 were entered for one or more Higher School Certificate Examinations.  In 1913 5.8% of the 14-16 year old population in England and Wales were in full-time education in grant aided schools/colleges.  In 1951 there were 27,700 public primary schools or departments in the UK. These were attended by 4.8 million pupils, there was an average of 171 pupils in each school and an average of 30 pupils per teacher.  In 1951 there were 5,900 public secondary schools in the UK. These were attended by 2.0 million pupils; there was an average of 342 pupils in each school and an average of 20.6 pupils per teacher.  In 1949-50 there were 2.4 million students who attended grant-aided establishments of further education (again mainly evening and part-time courses) in England and Wales.  In 1953-54 10.7% of the relevant age group passed five or more GCE O levels at schools in England and Wales. 5.5% of the relevant age group passed one or more GCE A level and public sector schools and further education establishments.  In 1950 17,300 students were awarded first degrees and 2,400 were awarded higher degrees at UK universities.  In 1950 30% of 15 year olds, 14% of 16 year olds and 7% of 17 year olds were in full-time education in England and Wales.  In 2010-11 there were 21,281 public sector mainstream primary schools. These were attended by 4.9 million pupils, there was an average of 231 pupils in each school and an average of 20.4 pupils per teacher. 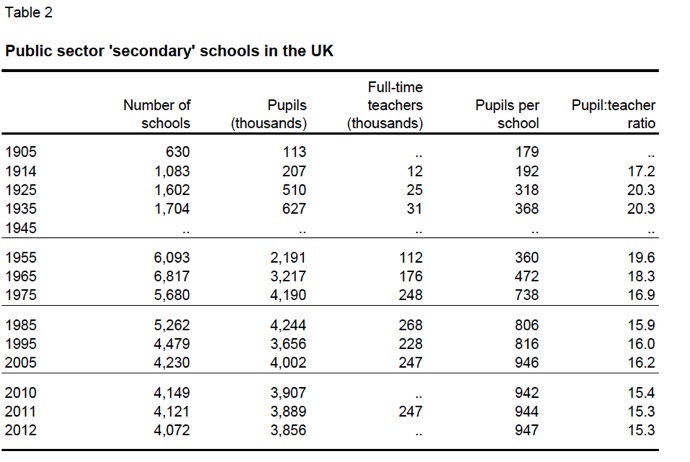  In 2010-11 there were 4,072 public sector mainstream secondary schools. These were attended by 3.9 million pupils; there was an average of 943 pupils in each school and an average of 15.3 pupils per teacher. 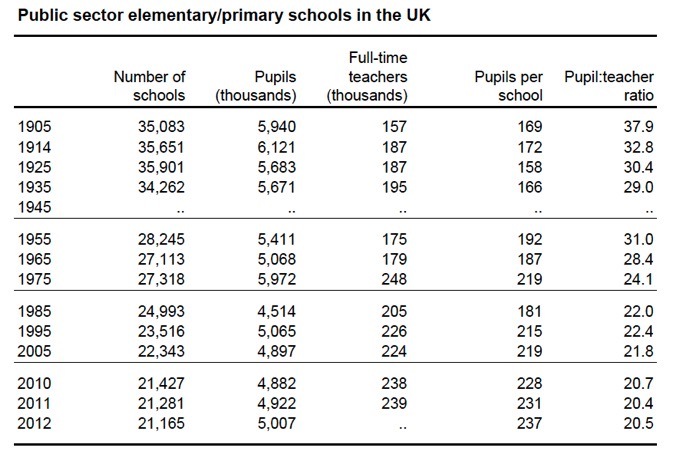  The average salary of full-time qualified teachers in public sector schools in England was £34,700 in November 2011.  Expenditure on education made up 13.3% of total public sector expenditure in 2010-11.  In 2010/11 there were 4.9 million learners who started a publicly funded further education course in the UK.  In 2010/11 79.6% of pupils in their last year of compulsory education in the UK achieved 5 or more GCSE grades A*-C or equivalent. In 2003/04 39.2% of the relevant age group passed two or more A levels or equivalent.  In 2010/11 331,000 full-time students were awarded first degrees at UK universities and 182,600 (all modes) were awarded higher degrees.  At the end of 2010 88% of 16 year olds and 76% of 17 year olds in England were in full-time education. i. SIZE. Universities cannot simply expand exponentially: they cannot simply take more and more students. They can't afford to do so (capital building in cities is very expensive), and there isn't physically space for them to do so (Oxford, for example, is only so big). They also can't take more and more students and maintain the same level of service or student experience (the NUS backs me up here). ii. PART-TIME AND MATURE STUDENTS. 61% drop in these kinds of students since fees were introduced. iii. HOMOGENISATION. Poor students can (in theory) afford to go to university with a loan, but in practice are far more reluctant to saddle themselves with debt, and thus the student body is a lot less mixed than it was when I was a student. I had friends from all over the world. The students I teach now are mixed, but that's because I *only* teach mature students; the undergrads are extraordinarily similar in terms of ethnicity and class. iv. ATTITUDE. Students used to put effort in and get a degree out. Now they put money in (a lot of money) and expect a degree out. While I don't like that, I think it's fair enough for a student to expect some kind of return (the fees are referred to as 'Tuition Fees', after all, thereby suggesting that one is exchanging money for teaching time, when of course one is doing no such thing). One of my customers has paid well over £40k for her PhD and has received almost no support from her supervisor in return. She's quite right to be pissed off.